The Gul Marine Tool is a excellent multi-functioning accessory, for emergency use or maintenance on board. 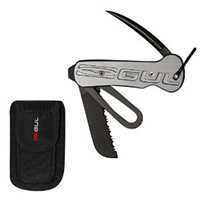 The serrated edge blade is excellent for quick and effective rope cutting, with a routed GUL logo providing extra grip. The Marine tool has been designed using titanium coated 420 Stainless Steel for extra protection from corrosion. Supplied with a Nylon sheath to easily store in your pocket.